OK, some of you may or may not know about the new Windows 7 beta (the release candidate 1). For anyone interested this is the new version of Windows that looks to be out sometime at the end of this year. To sum it up, it is a very good OS, much better than Vista (which was never as bad as everyone would lead you to believe). It seems to be faster and more stable than anything else before it. Not to mention being more feature-full and In my opinion at least, easier to use. These are of course all good directions for a new OS to take. I do however have one big gripe. You see, one of the best features they were introducing were libraries. These change the way things like the documents, music, and videos folders work (although you can apply this to anything). 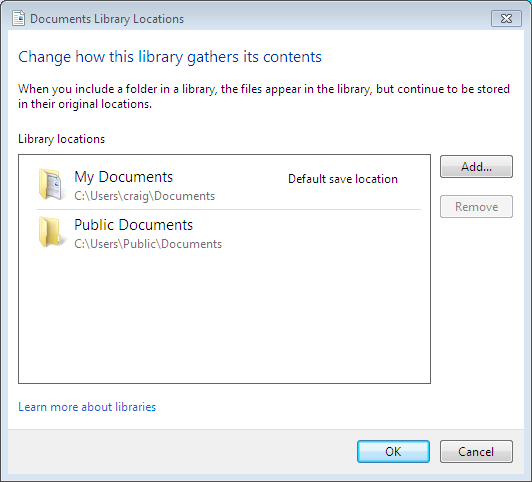 Your documents “folder” becomes a virtual folder made up of the different locations you specify. So say I have documents in C:UsersSome folder and I have data in D:meh. Well, then I just include these two locations and open my documents library and I see the data from both folders as one (you can set a default so it knows where to put new files). 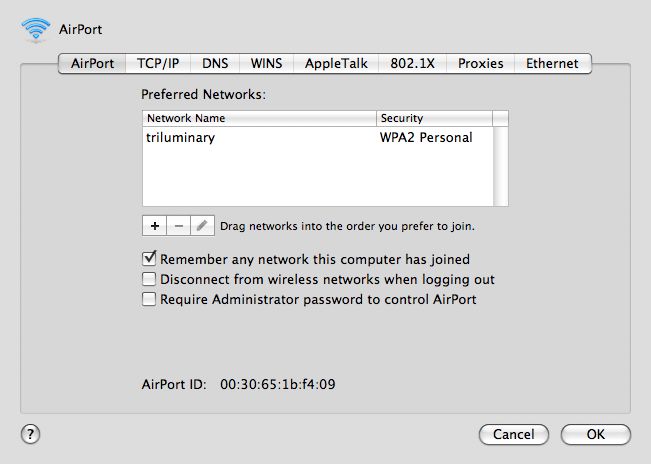 A feature like this would be amazing for things like the network setups I have in mind for the not so distant future. For example, I want my machine, Demelza’s machine, a Media center and a file server. 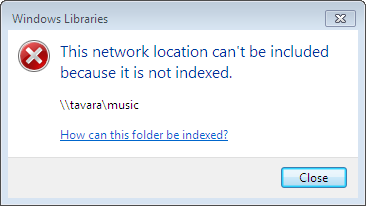 The file server has two music folders. One for my music and one for Demelza’s music. That way our music is stored off the machines which is so much nicer for millions of reasons. My machine will link to my folder and Demelza’s machine will link to hers. Now on the Media center I want all our music to appear, so I include both locations and that’s it. It will always have our current music. The thing about libraries is they are live. So if I were to delete something from my machine, it would delete off the network storage and just vanish off the Media center (as it should do). However, when I tried to add a Linux based machines shares (most Network Attached Storage is Linux based) I get the following. In short Microsoft, I can see where you are going with this error. However, you have just crippled one of the best features to come to Windows 7. I am so angry about this. This would have been so nice and you were so close, but then you broke it. You see, from here we have a couple of options. Either you set your share to appear offline (which defeats the whole sodding point!) or you have a current Windows box to share from (not practical for home servers yet in my mind). It seems they have assumed a mesh network of data. So in my example above I would have my music on my machine, Demelza has her music on her machine and then the Media center picks it up from both. But then I now have to have more storage capacity in the machines, I then have to worry about backing up each machine, not just one location. In short, it is a mess. Microsoft… You were so so close with this feature. Would you be so kind as to fix this. You see, this isn’t a feature, this is a bug. This is one of the most annoying bugs I have seen in some time. Not a good start. I don’t actually have any Apple software on my PC. I banned it after the whole pushing Safari as an “update” debacle. I have 133 applications installed on my computer. I’m not sure if this is a lot or not. I always like the idea of my machine being this lean, fast machine that works well all the time. However, I also want it to be able to do anything at the drop of a hat. I can’t help but notice these are two contradictory ideals. Scanning down the list of applications I can’t help but notice a lot of it was installed for a single task and left. Should I be removing these and then installing them again if needed (almost all the software on my machine is free/opensource) or should I be leaving them there given they don’t take up much space. I don’t know, I think for now I will take it on an app by app basis. Some of this stuff needs to go, I’m almost certain I will never use it again, but some of I would rather keep kicking around, If only to save myself trying to find it. Perhaps I need to start working on a software repository of known good stuff. It is well known amongst friends that I have never really been a fan of the Apple OSX since I started using it. It is too simple and too dumbed down. It is full of inconsistencies and inaccuracies. As such for some time I have been presenting some of what I find when I can be bothered. Today it has yet again annoyed me into pointing out a couple more of its flaws. 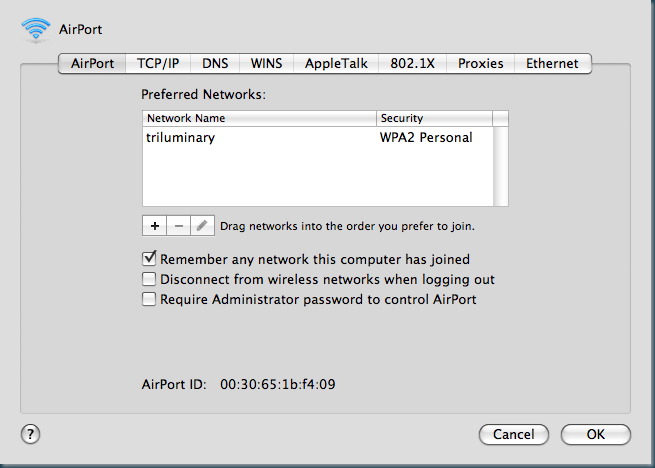 So our wireless network and my laptop seem to be arguing again. Not sure what is going on, I would love to fix it if OSX would give me a helpful error. Yeah, really handy there Apple. Every time I tried to connect I got that helpful gem of wisdom. 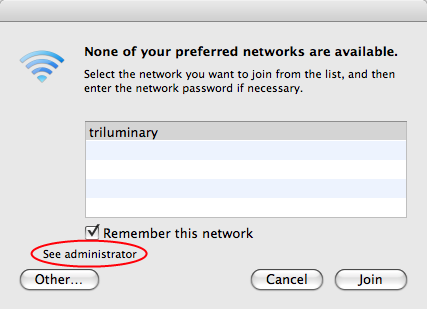 Some of you may have noticed that it claims none of my preferred networks are available. 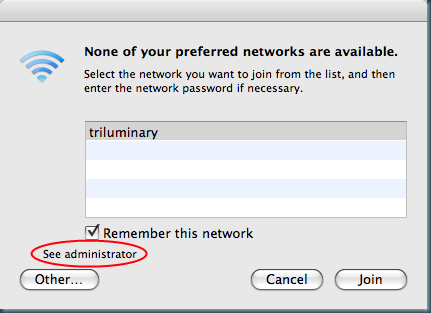 You will then note that I am meant to pick a network from the list of ones that are available. 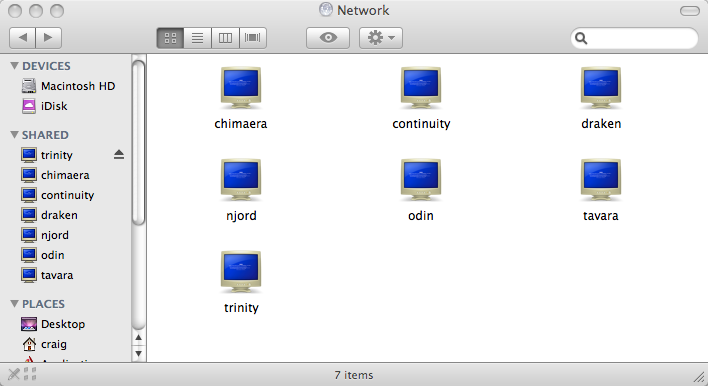 Just for kicks I have included a shot of my preferred network list. Yeah, thanks Apple, well done guys. I then gave up with the wireless and plugged it into the core switch. 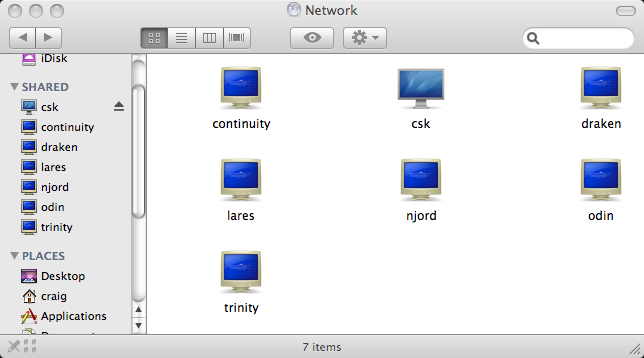 Went to the network and looked for machines on the network. Below is a shot of what I saw. You see, Apple being the smug guys they are think that it is really funny to show a screen with a Bluescreen of Death for all Windows machines on the network. Very funny guys… except, couple of issues here. 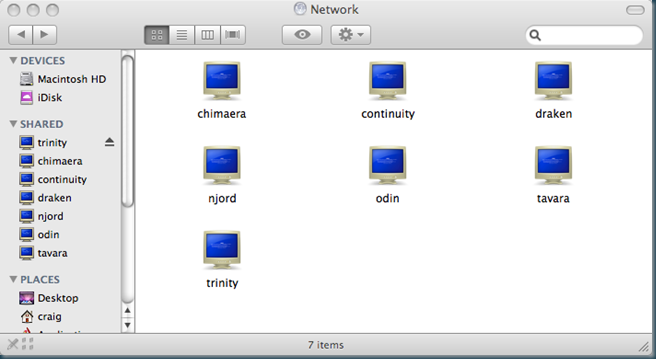 Firstly, there is only one Windows machine on this page, the rest are running all sorts of Unix based OS’s (like OSX is). Next, there are a couple of machines missing. My machine isn’t in this list, nor is Dom’s. Both of our machines are Vista based and have public shares on them. There is however one Vista machine on this list, it is Nik’s. Nik has recently re-installed his machine and as yet it doesn’t have any shares yet. Go figure that one. These people and their mickey mouse operating system scare me. I have for many years had trouble free computing. OK, maybe that isn’t quite true. Let’s try again. For many years I have never had a computer break down in any way whatsoever. I have never lost a file, I have never broken a piece of hardware. Actually, not quite true, I broke a single external harddisk which I took everywhere and to be quite honest, expected to fail. Disks were never meant to be moved around like that, they are too fragile. I have spent a long time fixing other peoples computers and something strikes me. It is always the cheap bit of kit that fails. It is the cheap power supply which dies and takes the motherboard with it, the cheap disk which last a year and dies, the cheap case where the fans clog and die etc etc. My case cost about £70. It is fairly expensive as cases go for the size. It is of high build quality, it is big, heavy and solid. I have never had any issues with it. On every air intake for fans there is a filter. I am always having to remove dust off the front of these. Every time I remove the side off the case there is almost no dust in there. As such my fans still run just fine, they can still run quiet and the rest of the machine is in good order. My power supply is made by Antec. These people have been the gold standard for any IT enthusiast since as long as I remember. There is good reason for this. I have a large high powered computer, it has 5 disks, a 4 core CPU and 2 graphics card. I am still running it on my 5 or something year old 550Watt power supply. It has to be fairly fully loaded and yet it still runs just fine. I have seen much larger power supplies give up and die at the mere sight of this hardware. Also, everyone I know who has ever killed an Antec power supply notes it never took anything else with it. This is a common problems with cheaper kit. As with before, Antec is not cheap. Hard disks have moved on a bit in recent years. When you start seeing 5 year warranties on disks you know it is going well. Although, bear in mind that the disk my OS is on is again 5 or so years old and still going. I would say this is at least in part due to not picking the cheapest disks out there. I will admit some of the bits in my machine have changed, but all the computer hardware I have ever bought is still in active use. My old motherboard, RAM, CPU and graphics card are in my brothers machine and running just fine everyday. I will be the first to admit that my computing life has been far from trouble free, however, hardware wise I don’t really have any issues to my name. Compare this to the countless machines I have fixed, clearly there is more than just luck going on here. Perhaps the next time your thinking of buying a new machine that extra £50 might save you something. A while ago I was given a perfect condition Acer laptop. Nothing that highly spec’d but still modern and perfectly fine for Windows XP. Perhaps some back story is needed. A friend of mine’s dad was having some issues with his laptop. She called me and I spoke to him. I helped him out with a few problems from anti virus not working to spyware and malware getting onto his system. All just phonecalls and me typing suggestions. Nothing that special, the sort of thing I do all the time. A month or so ago said friend got in contact to say the laptop issues were over, he had bought a new laptop. Fair enough, good for him. Then I was asked if I would like it. As far as he was concerned it didn’t work and had stability issues. I explained I didn’t really need it and all I would do if I could get it working would be install XP on it and leave it until someone’s computer breaks and hand it to them to keep them going. Week later it turned up in Brighton in a huge box via the post. 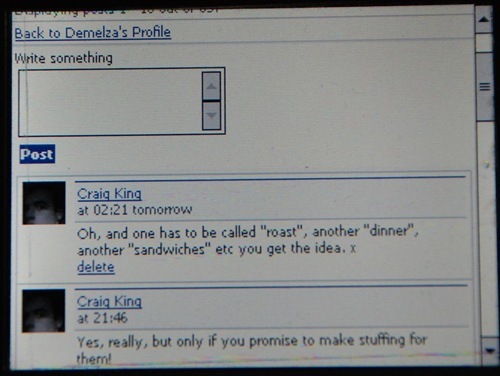 I duly thanked him and set about having a look at it. It seemed too good to be true. It was in mint condition, I mean, it looked new. I broke out my XP disk and set about installing XP pro on it. I got it running in an hour, installed the drivers. All seemed to be going well. Then I put it down, leaving it on for an hour or so and came back to. It refused to take any input. Nothing from the keyboard or the mouse. It was clearly all running but just not responding. I reset and left it again and the same happened. Clearly it had some stability issues. It didn’t seem to be getting too hot, I took it apart and dusted it out just in case. Still the same thing happened. OK, so now I booted it up into the BIOS and left it running for a few hours. No lockups, none at all. OK, maybe it was just Windows. Then I installed Ubuntu Linux, then as before, left it running a few hours and checked up on it. All just fine. OK, so clearly not hardware. Then I remembered that when I first had issues with it under Windows I had the drivers all installed. Maybe one of those was the issues. So, today I finally got around to trying out Windows without the drivers. Well, I say I got around to try that, I started the install, then about three quarters of the way in it stopped accepting inputs. Surly It can’t be just Windows? I have just downloaded and am now installing Ubuntu Studio to see what it makes of that. I have always wanted to play with this distribution anyway. Assuming this works (which I expect it will) then it would seem I am left with an anti Windows laptop with a “designed for Windows XP” sticker on it. Irony anyone? As a side note, the new sidebar on the left is of my own construction thanks to something called Samurize. This allows you to add all sorts of “meters” which can measure pretty much whatever you like on the machine. Quite fun, quite sad and actually really handy. 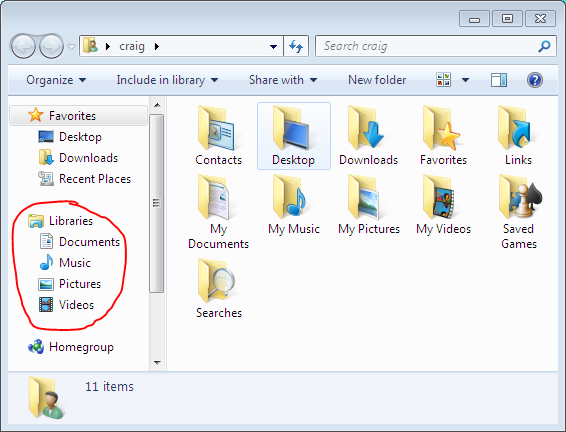 I have managed to replicate in a much nicer form the features I was using in the Vista sidebar plus a few extra ones. To give you an idea of how powerful a tool this is, that clock in the top left was made from scratch, as was the CPU core meter. The volume and notepad are still sidebar gadgets and the volume replication is what is driving me mad. Ah well, another day perhaps. Anyway, if you are one of these people like me who like to know exactly what is going on with your machine at any point this is a very worthwhile tool. Statistics on passwords are rare things. Anyone with the tiniest clue about computer security knows that passwords should be stored in some encrypted form to ensure that if someone did break into your system they couldn’t just read everyone’s passwords. Clearly the world is not just full of smart people so when a largish website got hacked a little while back and its passwords were found to be in plain text the result was inevitable, they got released to the public. However, the story doesn’t end there. You see, I happen to be part of a big site that stores it’s passwords in this painfully bad plain text way. I also happen to be fairly high up there and have at times helped out with the codebase and database. In fact, I still had an old database backup kicking around which I hadn’t got round to removing. Now Physorg had 28,000 passwords to look at. I on the other hand have over 130,000! Suffice to say, this is probably more passwords than almost anyone else in the world can get hold of due to most sites default security. Of course with a resource like that I couldn’t help but do a little statistical analysis. Here is a list of the most popular passwords along with the number of times each was used in the 130,000 people. The first thing that strikes me about these results is the number one password is a very very odd one. In fact, my guess for some of the more random results at the top is they are due to spammers. The site this data comes from has issues with several members making loads and loads of fake accounts.In fact, I have passed this data onto the site owner as a possible way of identifying this person more accurately. Next we have the string “123456”. This password makes up almost 1% of results. This is a huge number and actually pretty scary really if you think about it. What is even more scary is that if you take the numbers 1 to 9 and 10 as a string (aka, 1, 12, 123, 1234, 12345, 123456, 1234567, 12345678, 123456789, 12345678910) you end up covering almost 2% of all the passwords. I also find it a bit of a worry when we have things like “password” and “qwerty” appearing high up the list too. The other thing i noticed from this data is the number of real world words appearing. By this I mean things susceptible to a dictionary attack. I thought by now, especially teens (which is who this is data is from) would know what is and what isn’t a good password. Ideally it should be something unrelated to you (so not your date of birth! ), something not in the dictionary, contain at least a mix of letters and numbers and if at all possible, be a miss spelling with random capitalization. So, something like gU1t4 for guitar, or how about pU2z1e for puzzle. It should be something that you find easy to remember or work out. car number plates are good, but don’t use your current one. old phone numbers, maybe with letters in the place of some numbers. Failing that, use something like Keepass. It stores login details including passwords and locks them all under one master password that you should never write down. As someone who normally works on a screen that technically has a ratio of 30:8 I am all for widescreen. I think the terrestrial move from 4:3 to 16:9 was great idea. I also love seeing films in full 21:9 at the cinema. If feels much more involved when you watch something that is going that far beyond the old square screens we were once used to. There is only one problem with films at 21:9, all the widescreen TV’s we have are 16:9. In fact, resolutions that we have come to know and love for their quality such as 1080p are still only 16:9 despite films being shot in 21:9. Finally it seems someone has decided to address this annoyance. Phillips have stepped up to the plate with the first 21:9 TV for public consumption. Great you think, wouldn’t it be nice to get rid of those black bars top and bottom of the screen when watching films. Well, good news, Phillips don’t like black bars either, bad news they don’t like them a bit too much. Phillips in their infinite wisdom have decided that wider content is better, even if that content was not meant to be wide in the first place. So, when the TV gets given 4:3 content, it stretches it to 16:9 and when it gets 16:9 (so normal TV) it stretches it to 21:9. This of course makes everyone look a bit more squat than they should. In fact, it makes everything look a bit squat. This in my opinion is just plain mad. Why would someone who loves watching films etc want something that distorts almost every other bit of content they give it. Now this issue came up in an interview with Phillips on the BBC’s Click programme. Phillips response is they think people will want more immersive content more. Unfortunately the interviewer never pushed the issue, and in my opinion they should have. Phillips are bringing out a nice bit of kit that is actually something new in the TV market, and then they are completely breaking it with the software they are putting on it. Why is it it seems almost all people in Tech support are complete and utter morons? I reminds me of all the stupid encounters with tech support I have had over the years. Normally the first major problem I have to get them over is that I have already restarted the computer and that having them tell me to do it doesn’t make it suddenly have any greater effect. The next thing I normally need to get them over is that the issue is complicated. They always greet me with surprise when i detail the issue, half the time because it turns out they have never heard of it. 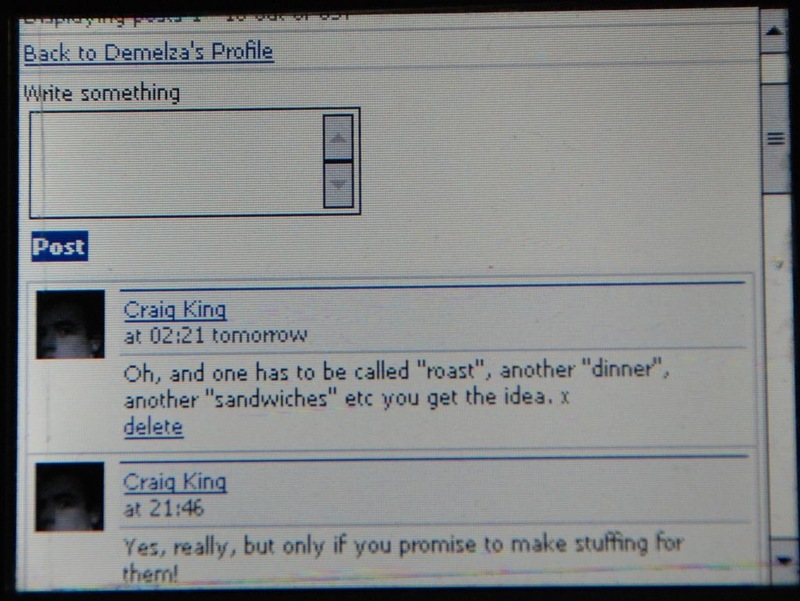 My favourite example of this was a year or so ago when I was having trouble sending emails on my mobile through Gmail. Now the fact that T-mobile advertised their mobile data plan as a nice way to get to services like Gmail suggest they should really know a thing or two about making it work.Turns out they didn’t in fact, the only way the issue got solved was by me saying it so slowly for their tech to understand i figured it out without them. Then you have to get them over the idea that they can’t just feed you meaningless suggestions with no real connection to the problem in hand. For example, when Tiscali wanted me to change my packet size to speed the connection up. I pointed out that this would give me about a 1% speed increase and I was looking for about an 800% increase. They then agreed that maybe that wasn’t the issue and we moved on. In fact, That issue took days! It makes me think that actually, the one part of the IT industry that is really not being fully tapped is support. Tech support people who know how to do more than just turn it off and on again, Tech support people who don’t think “Linux” is an application or that your screen is blue because of a virus. Hell, most tech support calls could be fixed in minutes if the technician actually listened to everything they were told and thought about it instead of running from a script.